Imagine you have a client that has the same services scheduled week after week after week. A walk at 12:30 PM every Monday, Tuesday, Wednesday, Thursday, and Friday. Scheduling this client manually every week would be tedious and time consuming. Access your Scheduler by logging into your Dashboard and clicking the Scheduler link in the left sidebar. Click the tab labelled “Templates”. Click the “Add New Template” button. Fill out the form and click “Save Template Details” button. Templates are highly customizable and thus this form has many different options. We will walk you through them all now. Name: A name for this template for easy reference later. Client: Who is this template for? Billing Frequency: This is where you can establish how frequently your template is approved. This also controls how frequently the invoice for the template will be generated. Templates can repeat on a Weekly, Multi-Weekly, Semi-Monthly, or Monthly basis. A weekly template is Sunday – Saturday. A Multi-Weekly is also Sunday – Saturday but it can span multiple weeks. For example you could have a Multi-Weekly template that spans 3 weeks. Semi-Monthly is two approvals per month for visits between the 1st and 15th of the month and between the 16th and the end of the month. Monthly templates span one month. Before selecting the "Billing Frequency" field, it is helpful to ask yourself, "How often do I want to generate a new invoice for this template?" How Often: How often does this template repeat. This option is only available for Weekly and Monthly templates. For example you could create a Weekly template that repeats every four weeks. 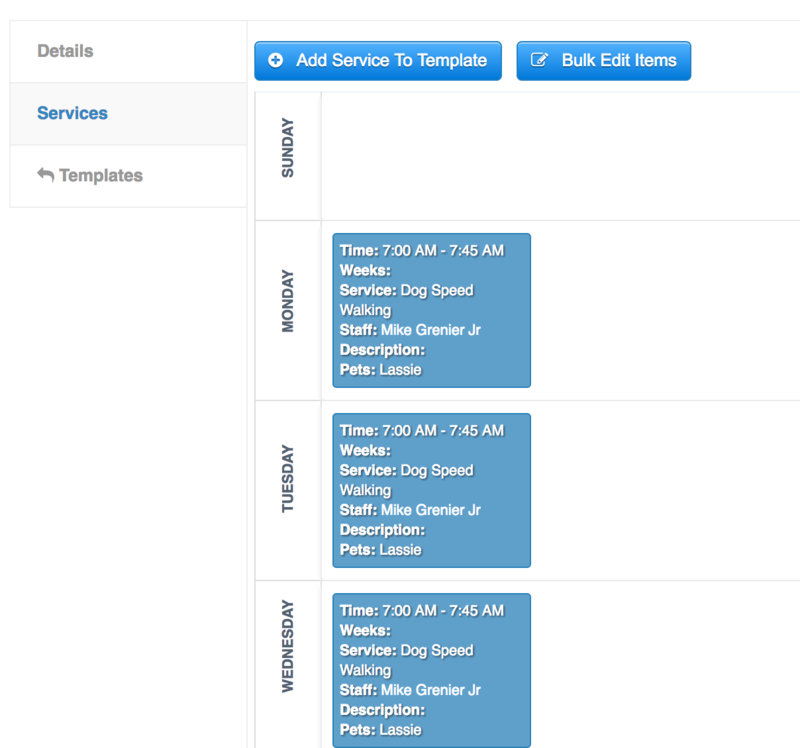 That means only once every four weeks will the services in this template be added to your calendar. This is helpful if your client is a pilot and only works one week on then has three weeks off. Weeks Per Period: Only available for Multi-Weekly templates. Specifies how many weeks this template spans. First Occurrence: The first time period this Template should approve into. Templates require a full period. For example, if it is February 16th, the first time a Monthly template will be available is March 1 – March 31. Approval Method: Whether you wish to manually approve this template each period, or have it automatically approve (more information on Approving Templates available below). Approval Date: How many days before the Template’s first day should the Template automatically be approved (or for manually approved templates, how many days in advance to warn you). Defaults to 3 days before and can not be more than the 180 days. Invoice Date: All Invoices generated by this Template will follow the date rules configured in Invoice Settings. You can override this on a Template by Template basis by changing this setting. Invoice Due Date: All Invoices generated by this Template will follow the due date rules configured in Invoice Settings. You can override this on a Template by Template basis by changing this setting. Projections: We will automatically block off time on your calendar for events that are part of this template so you know not to schedule other services at this time. This setting configures how many weeks (or months for Monthly templates) into the future to block off the time on your calendar. This option can be completely disabled. Description: A brief description of the template. Once a template has been created, we need to add services to this template. Click the “Add Service To Template” button. 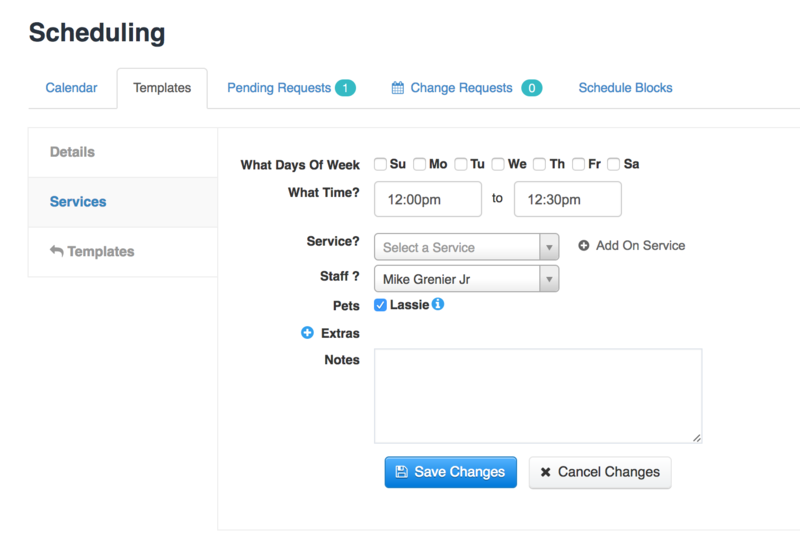 A service form will appear where you can select the details of this service including the Staff, Service, Time, Client Pets, and which days this service is part of. When finished click “Save Changes” button. You will now see the services listed for the Template. Templates that are set to automatically approve will be approved without any action required on your part. You can override the automatic approval at anytime by clicking the “Cancel Auto Approval” button. Doing so makes this instance of the template work the same as a manually approved template. You will now need to manually approve or deny the template. 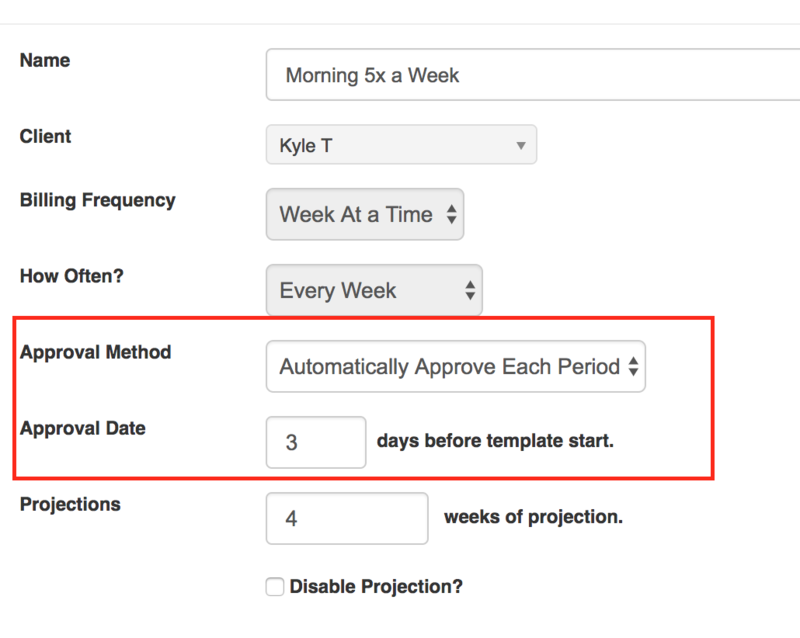 Templates are automatically approved 3 days (or the custom number of days you have set) before the first day of the period. Templates that need manual approval will not show up on your schedule until you manually approve them. You can approve them manually at anytime; however, when an approval is due soon we will indicate that a manual approval is required. When a template that needs manual approval is Past Due, we will show you the template is Past Due.